Novus Green offer Solar Street Lights staring from 9 W to 60 W LED Luminary. Our Solar Street Lights are tested and having excellent performance record. Solar Street Light works without grid power. It totally relies on solar energy, which is clean, endless and environment-friendly. 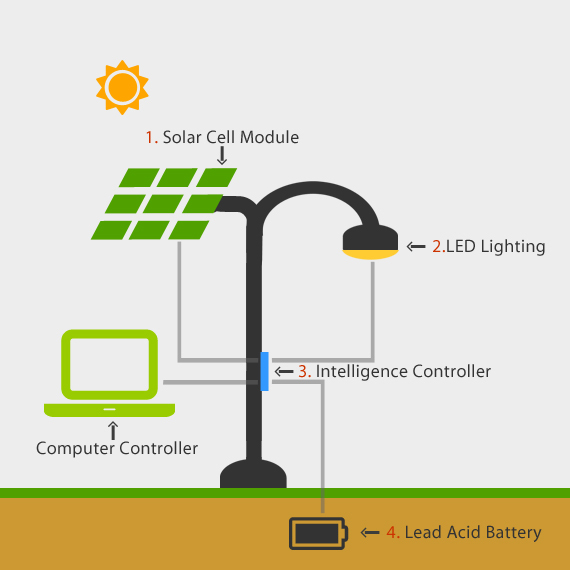 The system is mainly composed of solar panel, light source, controller and battery. In daytime, when there is sunshine, the solar panel can convert the solar energy to electric power and store it in the battery. At night or rainy or cloudy condition, the controller can judge the brightness of daylight and automatically switch the light on. And the battery shall supply the power for lighting. The solar street lights are applicable for road lighting, courtyard lighting, landscape lighting, and so on, in both cities and villages. Comparing with grid-powered street light, the solar street light has advantages of no consumption of grid power, no electricity charge, no need of power supply facilities, no pollution, easy-installation, one-time investment long-time payback, etc. Cost-effective: requires no trenching, cabling or electrical grid connection. Easy to install: minimal technical expertise required; uses click-together plugs. Rugged reliability: robust design is ideally suited for remote, difficult to access locations, or areas that have unreliable or no power supply at all. Install and forget: no scheduled maintenance or servicing for up to five years and no light bulbs to change. Vandal resistant: aluminium hardware and tamper-proof screws. Eco-friendly: Sol uses 100% recyclable gel cell batteries, LEDs produce no CO2 emissions.